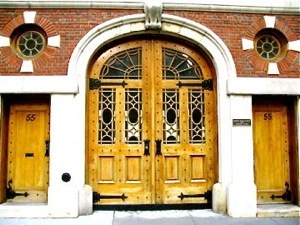 The Nursery Division is located in a landmark building on Manhattan’s Upper East Side that was originally the carriage house of the Andrew Carnegie estate. The original three-story structure was renovated and expanded to six floors in 1961 and became the New York School for Nursery Years. In addition to the nine classrooms in the Nursery Division, the building houses a library, a studio, a yard with climbing equipment, and a rooftop playground. The Lower Division campus in the Riverdale neighborhood of the Bronx occupies the site of the former Barnard School. The main Lower Division building houses classrooms for grades one through five, as well as the library, gymnasium, cafeteria, arts and technology center, music room, Music Annex, Nurse’s office, modern language classrooms, literacy center, math lab, speech lab, science center, and administrative offices. Kindergarten classes are housed in free-standing “cottages” that are nevertheless an integral part of the Division. Facilities that contribute to the Lower Division program include the “Grasshopper” (a synthetic play surface) and the O’Neill Arboretum. The campus is also home to the Alumni and Development Office. The 18-acre Middle/Upper Division campus overlooks Van Cortlandt Park in the Bronx. Campus buildings include Tillinghast Hall, which houses classrooms, computer laboratory facilities, and the Katz Library. Alfred Gross Hall (1961, rebuilt 2005 as Mullady Hall) contains the 650-seat Gross Theatre, along with The Heyer Upper Division Administration Suite and guidance offices. Pforzheimer Hall (1956, renovated 1999) and the Gratwick Science Wing (1975) include classrooms and facilities for science as well as Middle Division offices. The current Middle Division moved into Rose Hall in September 1999, adding the sixth grade to the existing seventh and eighth grades. Rose Hall contains classrooms, an atrium, and division offices. The College Counseling Office is located in Pforzheimer Hall. Prettyman Hall (renovated 2018) is home to the Richard A. Friedman '75 Gymnasium, Steven M. Friedman '72 Gymnasium, Simon Family Fitness Center, Okin Family Athletics and Physical Education Office, the Moose Miller Room and locker rooms. ~Prettyman Hall is adjacent to Friedman Hall (2018), a welcoming atrium for student athletes and campus guests, and the Jeffrey H. Loria Family Aquatic Center (2018). Outdoor facilities include Alumni Field, Four Acres Field, Andrew Feinberg '96 Tennis Center and handball courts. Van Cortlandt Park provides additional space for athletics. Fisher Hall (1999) includes studios for the visual arts, music classrooms, the Gallery, Sanders Recital Hall, the Cohen Dining Commons and the Berger Faculty Dining Room. Lutnick Hall (2018) houses the Mignone Independent Research Labs, science laboratories and classrooms, the Olshan Great Room, the Mindich Family Campus Center and the Center for Community Values & Action. In 1965, Horace Mann established the John Dorr Nature Laboratory in Washington, Connecticut with a gift of 83 acres. The Laboratory now encompasses 275 acres of fields, streams, and ponds in which students can explore nature and engage in outdoor pursuits. 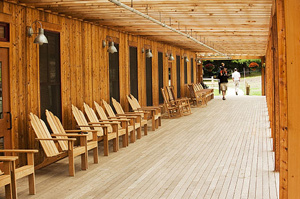 Dorr’s resident faculty instructs students in environmental science, conservation, and outdoor living. Student visits begin in the second grade, with overnight programs beginning in the third grade. The eight-day program for eighth graders includes a three-day backpacking trip along the Appalachian Trail. A recent $8 million capital project resulted in the creation of a new access road, the purchase of an additional parcel of land on which a new faculty residence is situated, the construction of a new bunkhouse, and the building of a new lodge and multi-purpose barn. The project also upgraded mechanicals and utilities. The new facilities insure greater sustainability and provide more space for programming. Horace Mann is one of the largest property owners in the Fieldston community and is a member of the Fieldston Property Owners Association. Horace Mann owns nine houses in the immediate area; three are used for administrative services, including the Business Office, Office of Alumni and Development, and Summer on the Hill; two are used for instructional purposes as kindergarten cottages; and four provide housing for administrators. The School also owns six vacant properties, two in the immediate vicinity of existing school buildings and the remainder on Broadway. These properties are held for future instructional and other uses. Our Athletic Teams play on several fields. 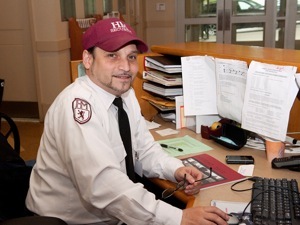 Horace Mann employs a 14-member security team that helps to foster and maintain a safe, comfortable and nurturing environment for the entire Horace Mann community. All visitors to the Horace Mann campuses are required to sign in at one of the Security posts and obtain a Visitor’s Pass, which should be prominently displayed on their outermost garment during their visit here at Horace Mann. 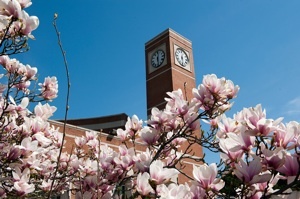 Visitors wishing to tour the campus must make arrangements with the Administration and/or Admissions office prior to their arrival so as to minimize any disruption of the school schedule. Alumni wishing to visit the campus should make arrangements through the Alumni Office.